Apple CEO Tim Cook spoke at China's World Internet Conference (WIC), where he declared that Apple's "partners in China" share the company's vision for openness. The Chinese government uses the conference to promote its program of internet regulation and censorship, but that did not stop Cook and Google CEO Sundar Pichai from participating, Bloomberg reports. Cook was the surprise keynote speaker, and he used his speech to praise the conference and cast a vision for cooperating with the Chinese. "The theme of this conference—developing a digital economy for openness and shared benefits—is a vision we at Apple share," Cook said. "We are proud to have worked alongside many of our partners in China to help build a community that will join a common future in cyberspace." Tim Culpan argued in an opinion piece that Cook was desperate to stay on China’s good side while Apple faces competition from Chinese firms that benefit from the country’s trade protectionism. "The Apple Inc. CEO, who last year stood up to the U.S. Federal Bureau of Investigation, took to the stage at China's annual internet conference this past weekend to kiss the ring and give his seal of approval for the way the government there tightly controls the flow of information," Culpan wrote. Culpan argued Apple is simply trying to maintain some standing in China where several technology competitors reside. 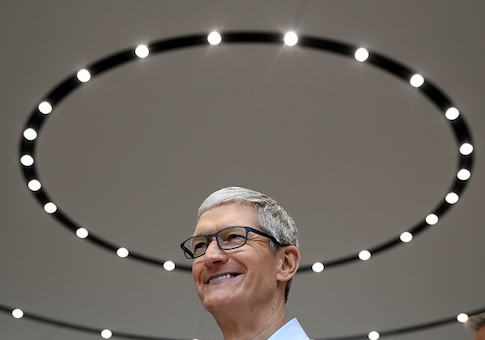 "Tim Cook is desperate to hold onto any remaining scraps of the China market," Culpan wrote. "That's a boon for the country's model for the internet, and the local players who dominate." Kirk Boodry, an analyst with New Street Research, said there is little reason to think China will liberalize its internet policies, which have shut out foreign competition to the benefit of domestic firms. "It is interesting to see Apple and Google at the WIC, but we doubt there will be any meaningful changes in China government policy," Boodry said. "Current policies have worked very well so far: two of the top five internet companies in terms of market cap are Chinese—supported by growth in consumer spending which is a key government priority." Google’s Pichai also touted the "cooperation" his company maintains with China during a panel on which he participated. "There are many small and medium businesses in China who take advantage of Google to get their products to many other countries outside of China," Pichai said. "Technology is giving opportunities at a global scale, driving interconnectedness and cooperation and I think it’s a big trend and I think it’s almost irreversible at this point." Apple has followed Beijing’s lead in the recent past as the company has bumped up against the communist government’s desire to censor internet access. Apple removed apps from its Chinese App Store in July at the request of the Chinese government. The apps included Microsoft Skype and virtual private networks, which previously allowed Chinese residents to bypass the "Great Firewall" and visit banned sites like Facebook and Twitter. The censorship actions are part of President Xi Jinping’s larger initiative to crack down further on internet access in China. Censorship efforts have even extended to academic research where materials about topics such as Mao Zedong’s Cultural Revolution and the 1989 Tiananmen Square massacre have been restricted. Apple’s leaders have been less gracious when talking about the Trump administration. In September, company executive Lisa Jackson blasted Trump for undermining the "transparency" of the Environmental Protection Agency (EPA). As of October 2017, Apple employees had given $143,148 in political contributions for the 2018 election cycle, according to data from the Center for Responsive Politics. Slightly more than $130,000–or 92 percent–of these contributions went to Democrats. This entry was posted in National Security and tagged Apple, China, Tim Cook. Bookmark the permalink.